One Christmas morning when I was little, my mom surprised my siblings and I by making cinnamon rolls for breakfast. Since then, I have made a special effort to make cinnamon rolls every winter break. 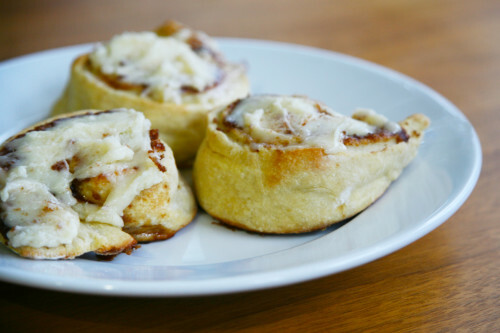 This is my favorite cinnamon roll recipe, mostly because it tastes exactly like Cinnabon! To make rolls, first dissolve the yeast in the warm milk in a large bowl. Add sugar, butter, salt, eggs, and flour to the bowl of a mixer and mix well. Pour the milk/yeast mixture in the bowl and mix well until well incorporated. Place dough into an oiled bowl, cover and let rise in a warm place about 1 hour or until the dough has doubled in size. To make filling, combine the butter or margarine, brown sugar and cinnamon in a bowl. Spread the mixture evenly over the surface of the dough. Alternatively you can spread the butter first on the dough and then the brown sugar and cinnamon mixture. Working carefully, from the long edge, roll the dough down to the bottom edge. The roll should be about 18 inches in length. Cut the roll into 1½ inch slices. Place the cut rolls in the prepared pan. Cover them with a damp towel. Let them rise again for another 30 minutes until they double in size. Preheat oven to 350 F degrees. Grease a 9×13 inch baking pan. Bake for 20 minutes or until light golden brown. While the rolls are baking make the icing by mixing all ingredients and beat well with an electric mixer until fluffy. When the rolls are done, spread generously with icing.